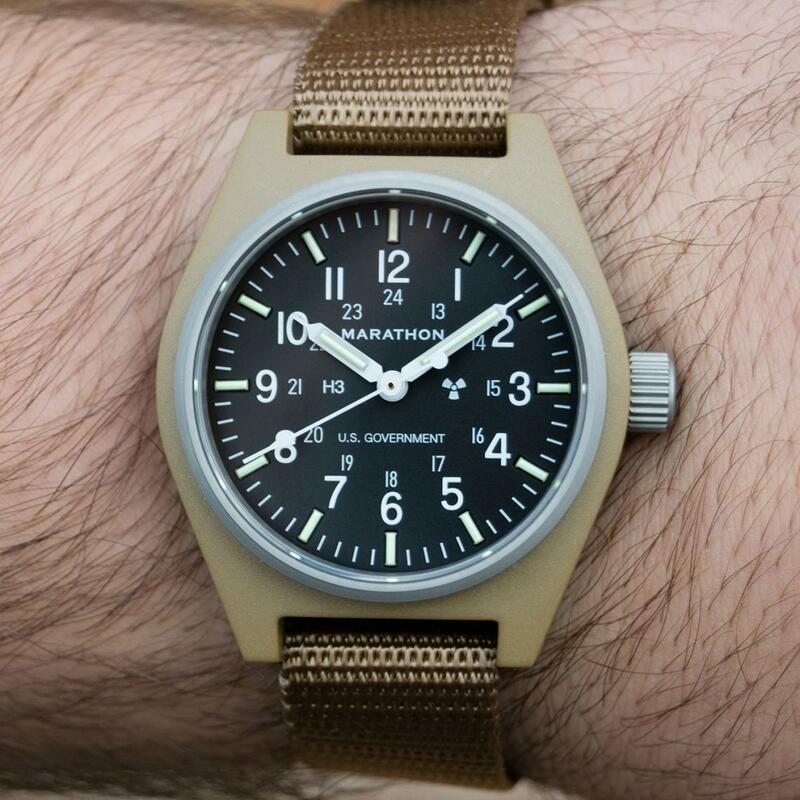 Marathon’s new and improved Automatic General Purpose Mechanical (GPM) watch is available with or without U.S. Government marked on the dial and in 3 colors! 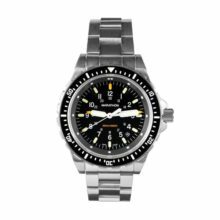 The watch incorporates a high quality Marathon designed 24 jewel Japanese dual wind movement while tritium tubes provide self-illumination of the dial in low light and darkness. 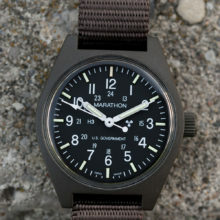 Designed to be used in the field by infantry or other military personnel and built to strict military standards, Marathon’s GPM is a lightweight, durable and comfortable all purpose watch incorporating the quality of both Japanese movements and Swiss watchmaking expertise. 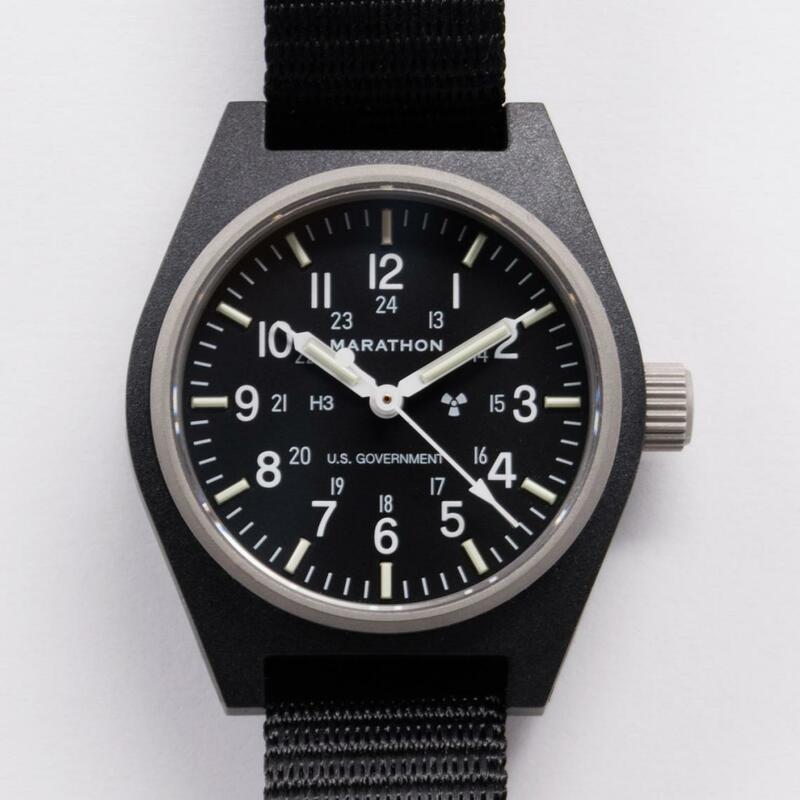 This watch will be your reliable companion for years. 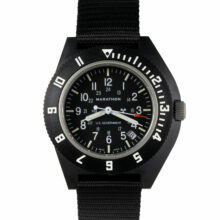 Marathon General Purpose Mechanical Wristwatch: Sapphire Crystal: Automatic with 24J movement in 3 colors! 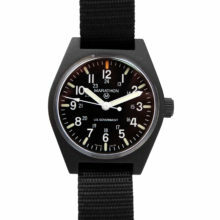 Today’s new and improved automatic general purpose watch with high-quality Marathon designed 24 jewel Japanese movement and bench assembled in Switzerland! 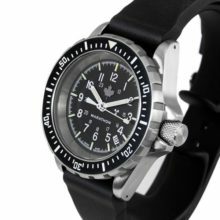 The Marathon General Purpose Mechanical Wristwatch: Sapphire Crystal: Automatic has a new design that incorporates a larger diameter dial opening and a dual wind 24 jewel automatic movement and scratch-resistant sapphire crystal. 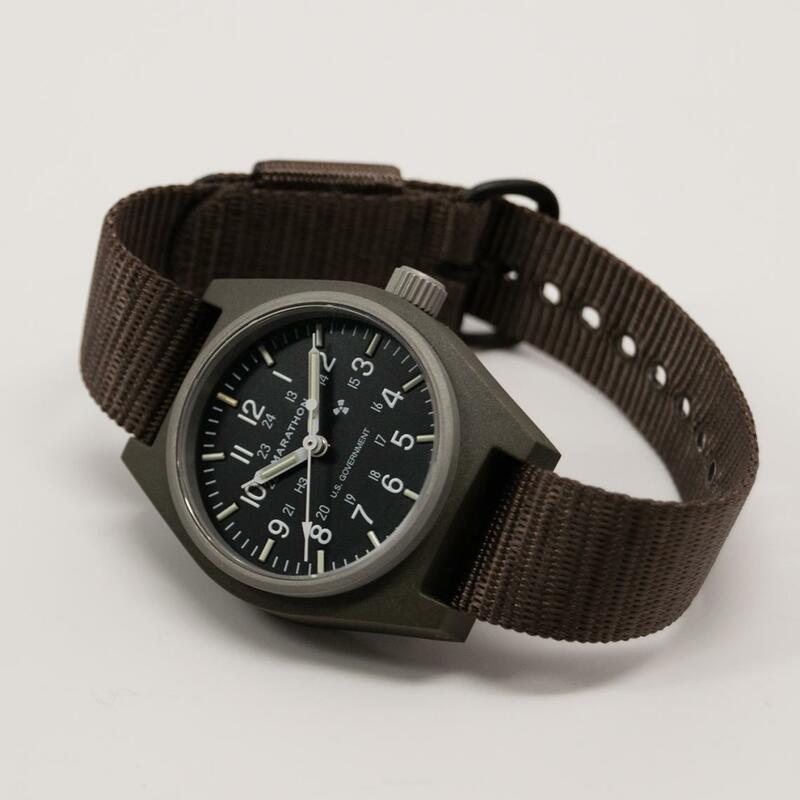 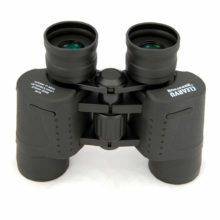 Designed to be used in the field by infantry or other military personnel and built to the strict military standards of MIL-PRF-46374G, the GPM is just as at home being worn by a civilian as it is in uniform on the battlefield. 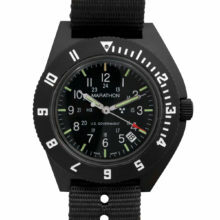 The GPM is a true all-purpose watch that will be your reliable companion for years. Each watch has a laser engraved back featuring government required nomenclature with a unique serial number. 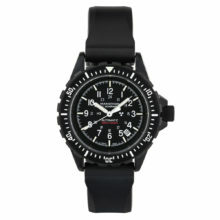 The serial number is also repeated on the box the watch comes in. 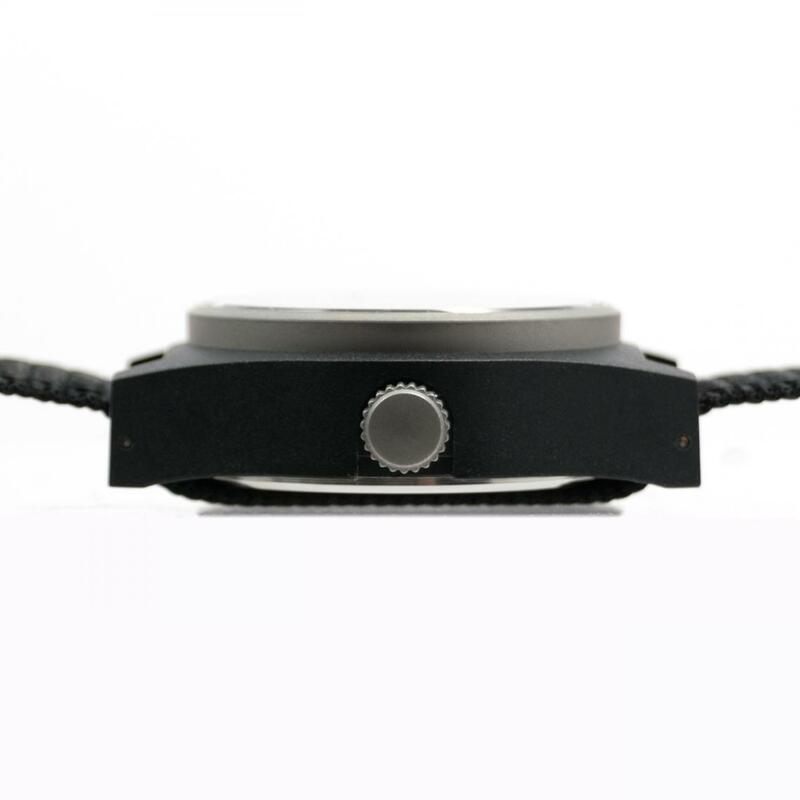 The new GPM uses a Marathon Japanese made “Dual Winding Movement” (DWM) by Caliber NH35A, and can be wound both by manually winding the crown or by use of the automatic self-winding rotor (transferred from the energy caused from the movement of the wrist). 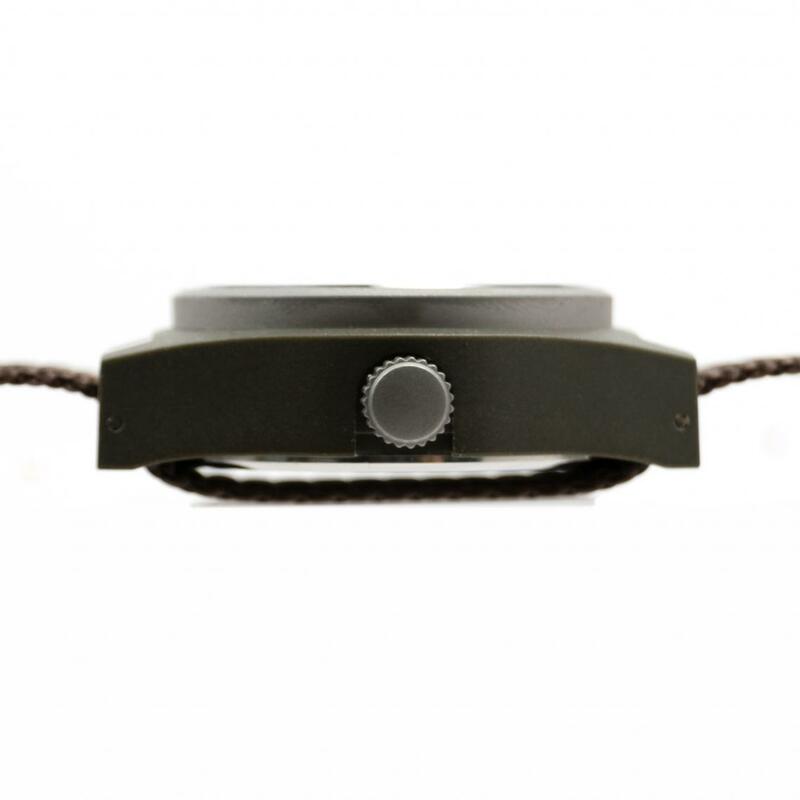 With our new watch winding system, the wearer will notice that there is an emission of a mechanical noise and a sensation of the rotor oscillating; reassuring the user that the automatic winding system is performing commendably. 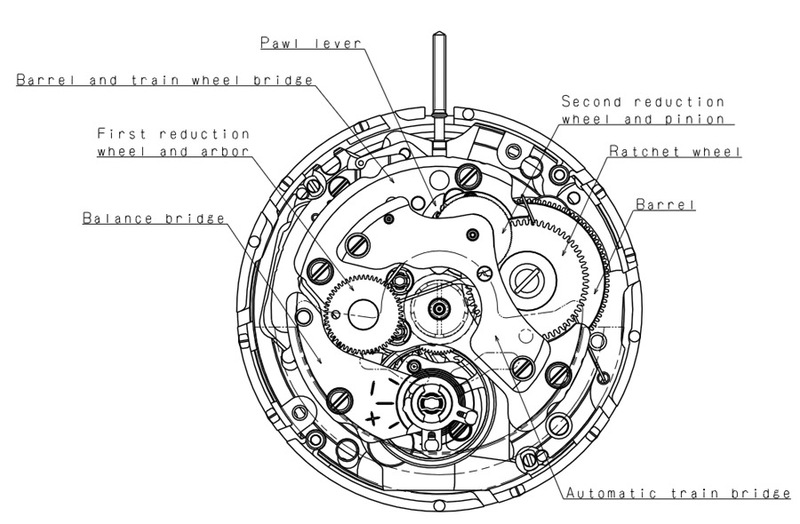 Once wound, the GPM will run for approximately 41 hours without the need to be wound again. 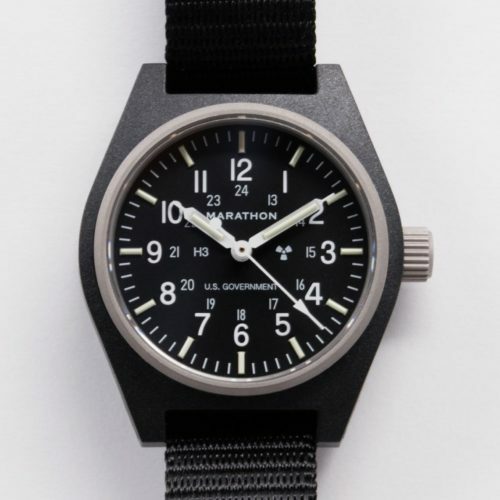 Thanks to the DWM, wearing the watch re-energizes the movement to run continuously for 41 hours. 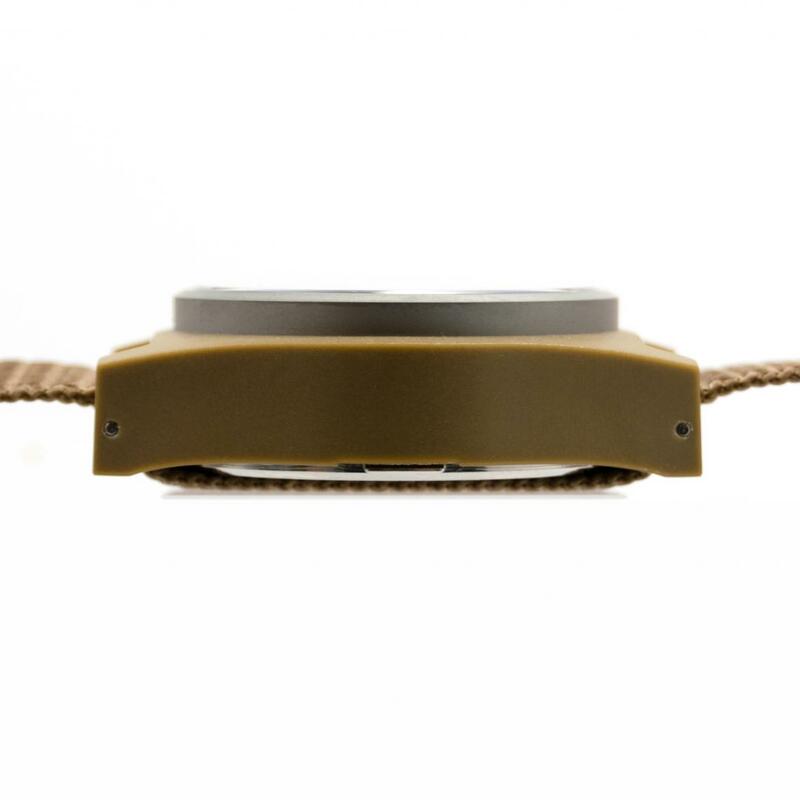 This movement has 24 jewels (friction reducing rubies), and comes in at a beat rate of 21,600 beats (ticks) per hour, providing a smooth sweep of the central second hand and high accuracy tolerances. 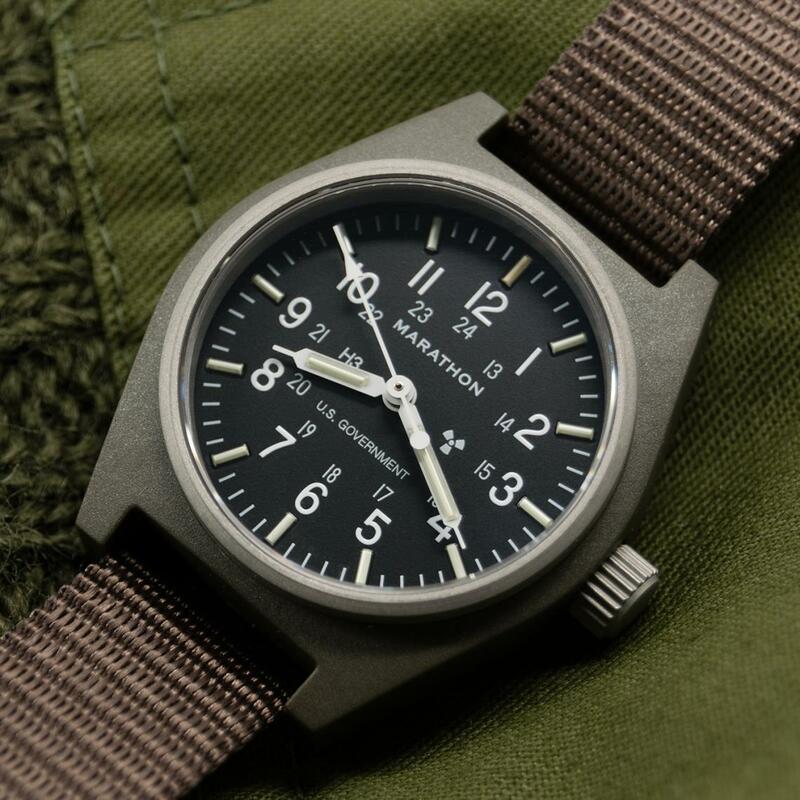 As the GPM is a field watch, Marathon was able to make the weight as low as 30 grams (without strap) due to the fibershell case, which does not sacrifice quality or durability, while keeping weight low. 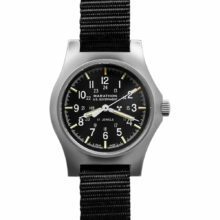 Applied on the dial, minute, and hour hands are self-contained Tritium gas-filled tubes which ensure a constant glow for maximum low-light visibility. 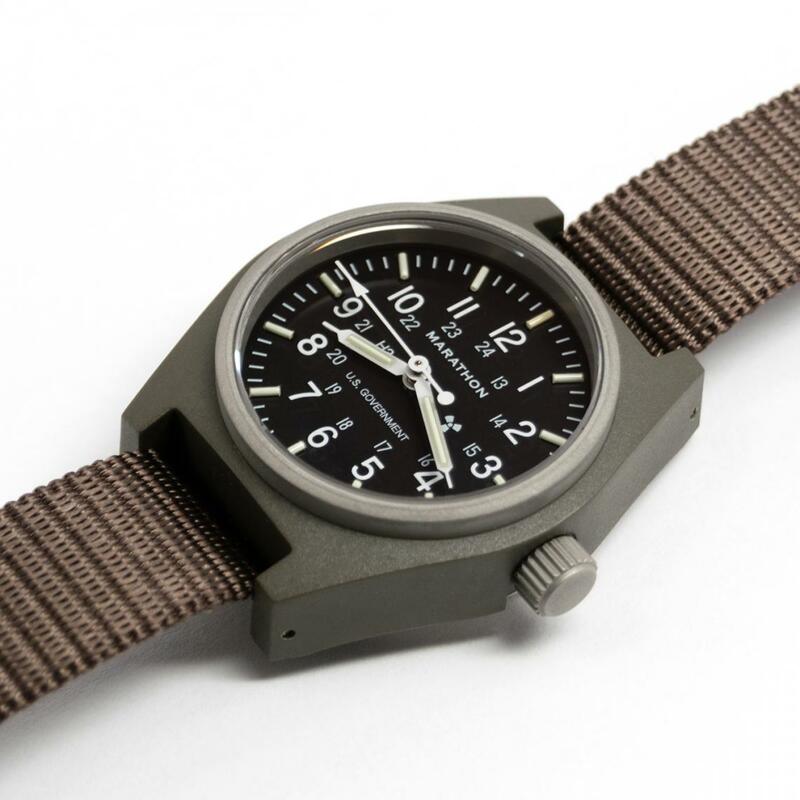 Tritium is a trusted source of illumination for military equipment, from watches to aeronautical displays, firearm sights, and binoculars. 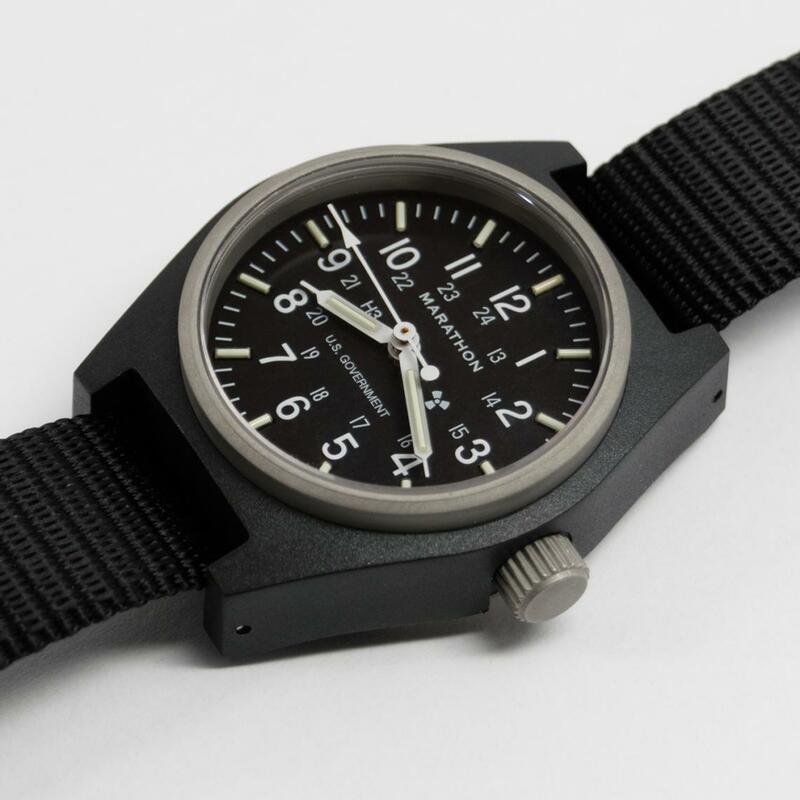 Tritium tubes glow on their own without the need for charging by an external light source, and will not fade in brightness making it an ideal configuration for nighttime or low light operation. 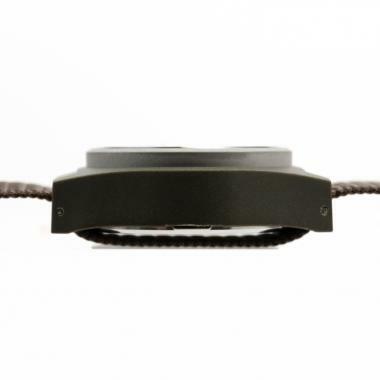 The new sapphire crystal is 3mm thick, providing added durability and impact resistance. 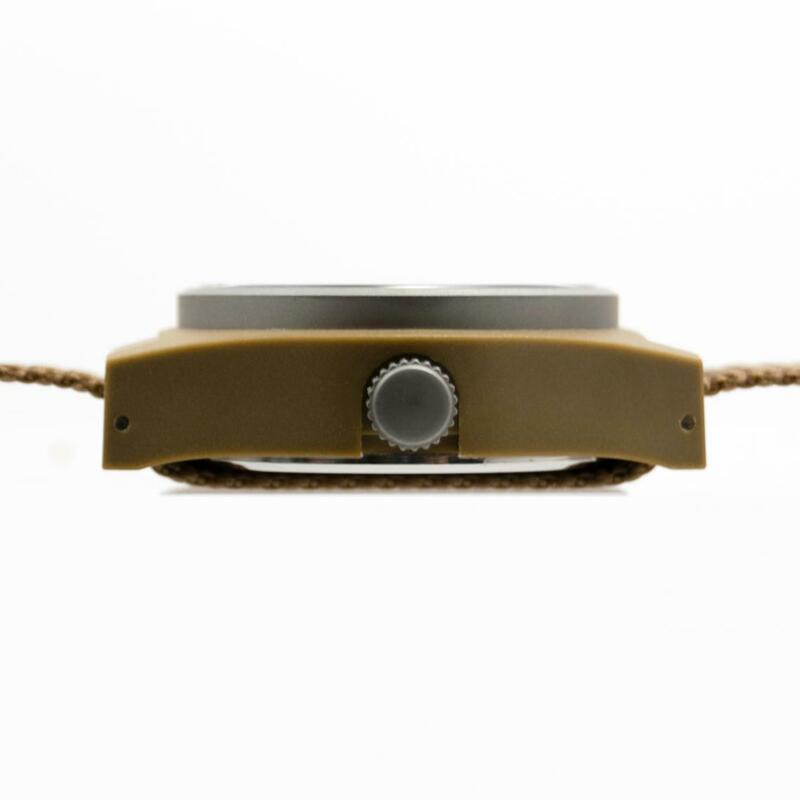 Adding to the overall durability and reliability is the upgraded water resistance on the new GPM giving it a water resistant of 5ATM (50 meters/164 feet), making sure that it will not yield to the elements. 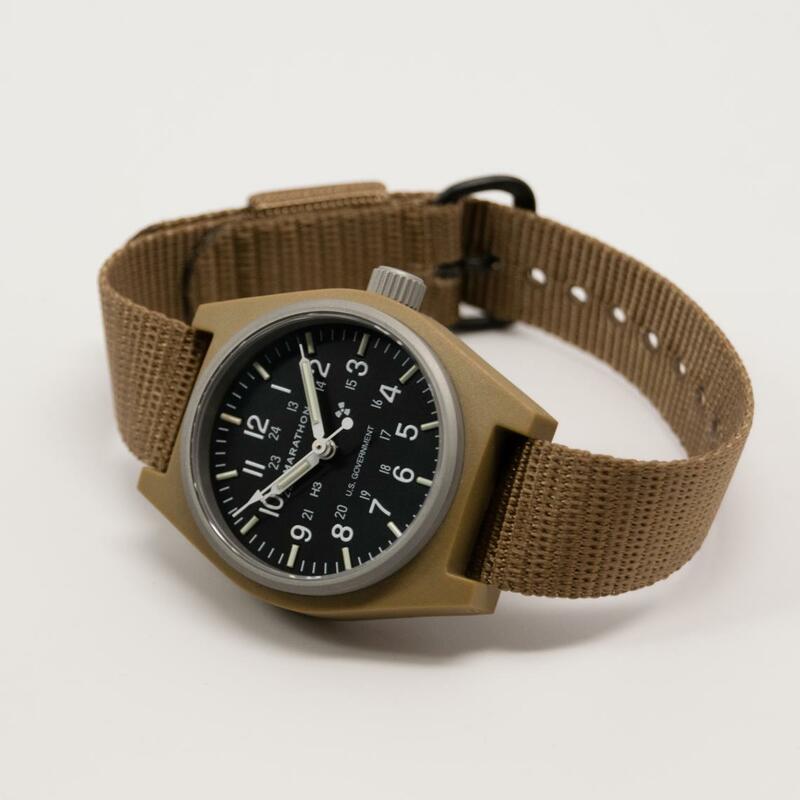 Included with the new GPM is a one-piece nylon military strap which is made in accordance with MIL-S-46383B Type II and provides comfort and durability while remaining lightweight. 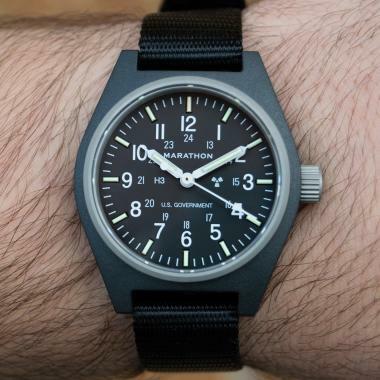 Also available are extra Marathon nylon straps in various colors to personalize your GPM. 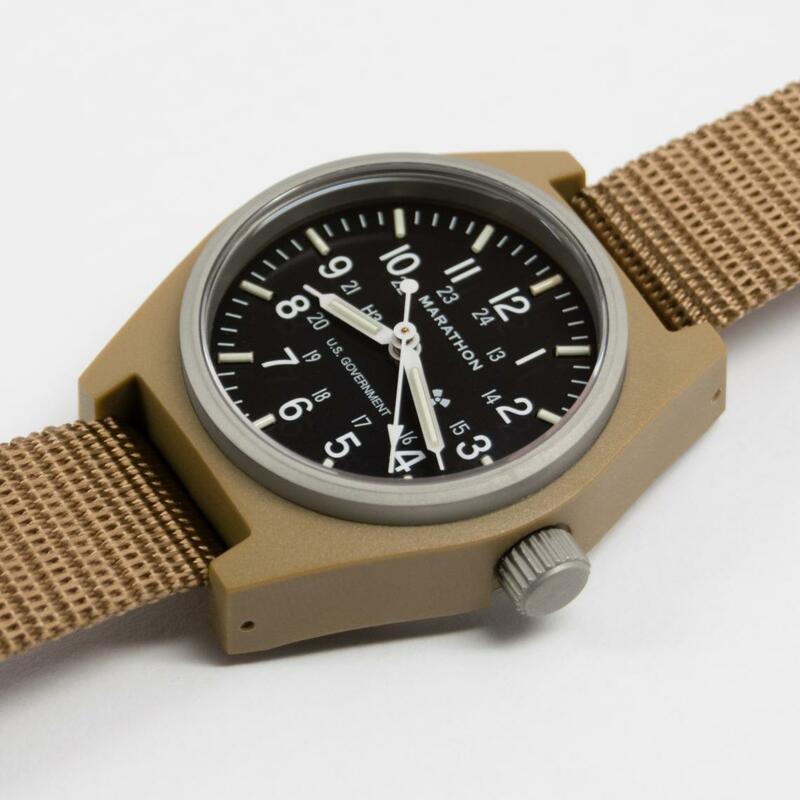 Try a Sage green or desert tan strap to add some variation. 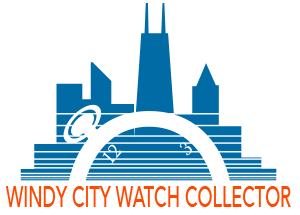 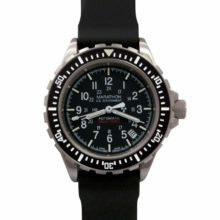 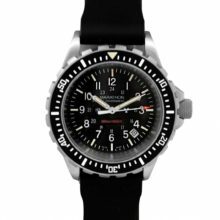 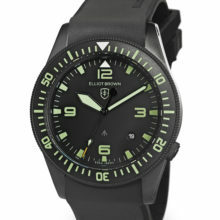 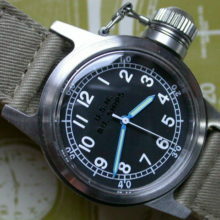 The watch is available with or without U.S. Government markings on the dial. 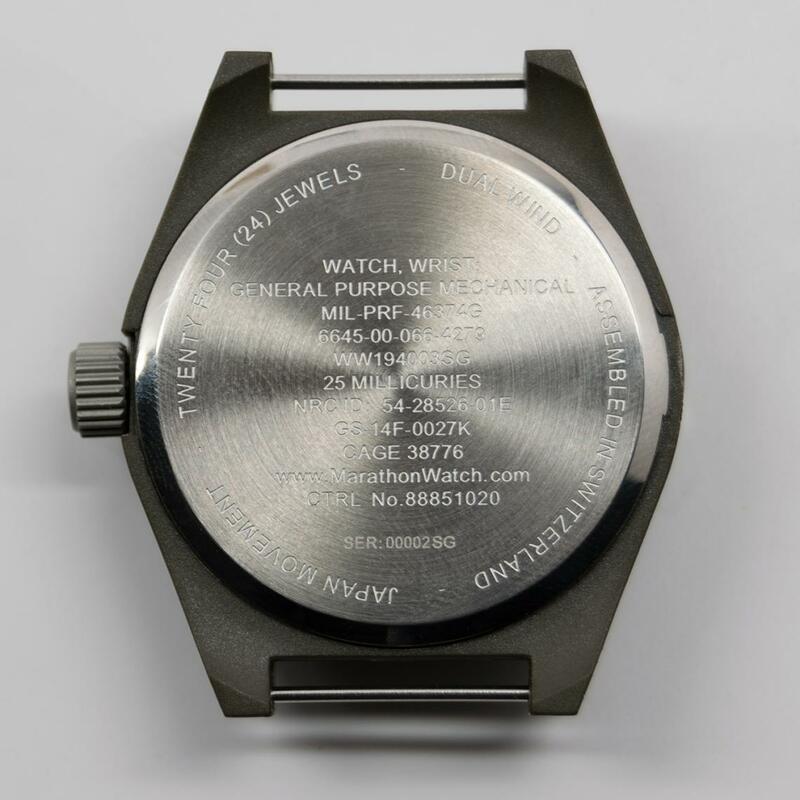 All watches have the required engraving on the back. 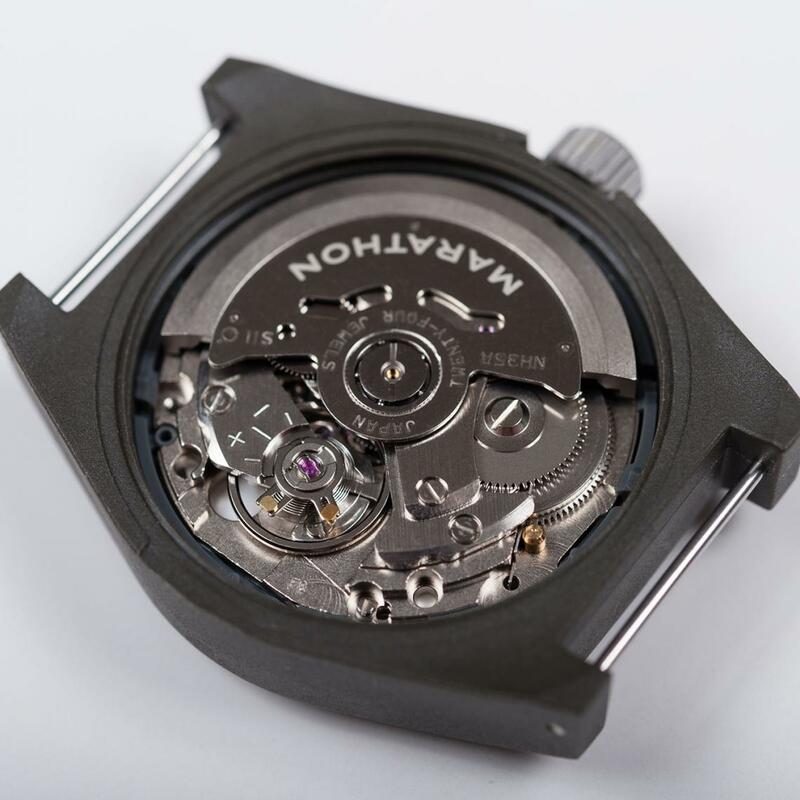 The overall assembly of the Marathon General Purpose Mechanical Wristwatch: Sapphire Crystal: Automatic is performed in La Chaux de Fonds, Switzerland, combining the accuracy of a Marathon designed Japanese movement with reliability and Swiss craftsmanship to bring you a superb watch! 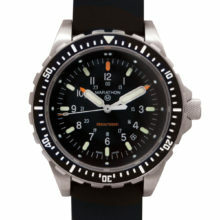 The Marathon GPM is a watch that will provide you with years of accuracy, reliability, and enjoyment!